The main aim of watershed management is to conserve the soil, plant, and water resources of a catchment while benefiting humanity. It combines environmental, social, and economic concerns with approaches to treat forest, range, agricultural, and urban parcels in an integrated manner. Ecological engineering that aims to design societal services such that they benefit society and nature can be considered to be an essential part of watershed management. In this context, watershed management can be defined as the design, construction, operation, and management of landscape/aquatic structures and asso ciated plant and animal communities to benefit both humanity and nature. The geochemical concept of elementary landscapes developed in the 1920s by B. B. Polynov, one of the students of V. V. Dokuchaev, the founder of modern soil science, and continued by the representatives of his school, was used as the basis for defining nutrient transport fluxes. According to the biogeochemical landscape concept, land scape is a geosystem or geocomplex, a comprehensive complex of natural (physical, chemical, biological) and anthropogenic factors distinguished at various hierarchical levels (i.e., micro , meso , and macrochores). A watershed (catchment) is considered to be a functional, well bordered part of this system. The association of soil cover and vegetation is the essence of the landscape system. In investigating material flows, elementary landscapes (elementary watersheds) are identified as the largest pos sible areas of uniform soil cover and vegetation. A common topological score of elementary landscapes in temperate agricultural catchments is presented in Figure 1a. In investigating nutrient transport, special attention is paid to the sensitivity of landscape elements. Particularly sensitive elements (e.g., hillslope hollows) serve as con duits for nutrient fluxes. 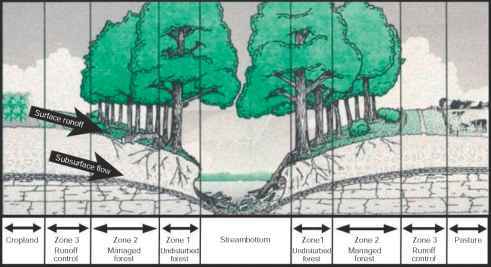 Resistant elements act as barriers or sinks (e.g., riparian buffer zones for downslope flow). In resistant landscape elements, where nutrients are held for a substantial time, transformations of material occur, and these are controlled by the complex of the qualities of the area (e.g., the transformation of nitrogen controlled by tree species and the availability of oxygen). The concept of excess nitrogen is used to address the issues of nitrogen transport in watersheds. The amount of potential excess nitrogen is commonly associated with the amount of applied fertilizer and escaped waste, which are closely linked to intensive agricultural and urban land use. The leaching of nitrogen into surface water occurs mainly in the condition of permeable (sandy) or acidic soil and the absence of slope (Figure 1b). Depending on these condi tions, the rate of leaching is usually 8.8-29.0 kg N ha 1 yr \ Leaching is typical for autonomous landscape elements. In the presence of slope and impermeable soil or artificial ground cover, surface flow dominates in the transportation of excess nitrogen. Depending on the con ditions, average surface flow is 3.4-15.9 kgN ha yr . Surface flow is typical for transit landscape elements. Figure 1 (a) A schematic topological score of elementary geochemical (autonomous, transit, superaquatic, and subaquatic) landscapes in watersheds according to B. B. Polynov's geochemical landscape concept from the 1920s; (b) mean fluxes of nitrogen (kg N ha 1 yr 1) and (c) mean fluxes of phosphorus (kg P ha 1 yr 1) are estimated from 45 sources in the literature. Adapted from Parn J and Mander Ü (2007) Landscape factors of nutrient transport in temperate agricultural catchments. In: Brebbia CA and Katsifarakis K (eds.) WIT Transactions on Ecology and the Environment, vol. 104: River Basin Management IV, pp. 411-424. Southampton, ÜK: WIT Press. much more extensively studied, and therefore greater var iance can be reported. Most of the estimated or measured fluxes are within 10-154 kg N ha 1 yr 1, but fluxes from 1.8 kgNha 1 yr 1 to 3110 and 6270kgNha 1 yr 1 have been reported from Western European autonomous land scape units to the superaquatic (riparian buffer) zone. Superaquatic landscape units are substantially different from autonomous and transit landscape units in terms of their flat topography, hydromorphic soils (Histic and Histosols), anaerobic condition, and natural and seminatural vegetation (forest, shrub, and grass). Such areas act as barriers for fluxes from geochemical transit zones. Due to this specific set of conditions, denitrification and plant uptake occur as the main set of output fluxes. Depending on the availability of nitrogen and the anaerobic condition, the rate of denitri fication at catchment scale has mostly been reported to be 15-32 kgNha 1 yr 1, but fluxes of 400 kgNha 1 yr 1 and more have been recorded. Denitrification in exceptionally aerobic parts ofthe subaquatic zone is similar to autonomous landscape units: 5 kg N ha 1 yr 1 and less. Plant uptake in superaquatic landscape units varies con siderably depending on human disturbance (harvesting), natural disturbances (flood), the aerobic condition, and pre sent plant species. Riparian vegetation is most commonly reported to be able to take up 83-146 kgN ha 1 yr \ although significantly smaller fluxes have been recorded. Vegetation uptake will only act as an actual nitrogen flux in the amount of grass or wood removed by human activities. The main sources of excess phosphorus are fertilizers, manure, and human waste. There is a well established link between available phosphorus and agricultural/urban land use. The intensity of leaching depends on soil acidity and permeability (sandiness). This is, however, a minor pathway of transport (0.052 kg P ha yr ), as a mean of 2.53.0 kg P ha yr flows from source areas in surface flow and subsurface flow (Figure 1c). In the presence of slope and pathways and a lack of vegetation, the flow can be 3. 1 5 kg P ha yr and more. In superaquatic conditions (even ground and the pre sence of natural and seminatural vegetation), plants take up a mean of 3.4-10.0kgPha 1 yr 1. Depending on these con ditions, plant uptake can be up to 13.1 kgP ha 1 yr 1. In most cases, only 0.06-0.73 kg P ha 1 yr 1 escapes from superaquatic landscape units and contaminates surface water. Depending on topography, soil, and vegetation, ripar ian fields and slopes can emit up to 0.8-11.3 kg P ha 1 yr 1.